All or Nothing, which re tells the story of 1960s Mod group, ‘The Small Faces’, is certainly not your run of the mill musical by any stretch of the imagination. There's no huge ensemble of dancers or a 21 piece orchestra swelling in the pit. Instead, the cast appearing as the four members of the group, play their own instruments giving the production a refreshing rawness and unpretentious quality that really works for its subject matter. The subject matter being, of course, ‘The Small Faces’. The show spans the four years of their rise and ultimate fall as drinks, drugs and greedy managers take a hold on the young musicians, who really only wanted to be able to play their music, in their own way. It tells the stories behind some of their most famous songs, such as Itchycoo Park and Lazy Sunday Afternoon. Carol Harrison, writer and co- producer of the production has clearly done her homework and obviously knew Steve Marriott pretty well. Her attention to detail is obvious, especially with the fabulous costumes. 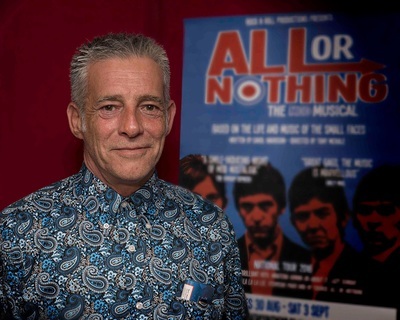 The story is told through the eyes of the now sadly departed, Steve Marriott (Chris Simmons), who guides us through a musical documentary of The Small Faces’ career. This is quite a long show (just over 2hrs 30mins) and there are probably a few scenes that could be tweaked; however, essentially what audiences want to hear is the band and all four actors playing Steve (Tim Edwards), Kenney (Drew-Levi Huntsman), Ian (Joshua Maddison) and Ronnie (Joshua Dowan) consolidate well to provide the unique ‘Small Faces’ sound - Tim Edwards, especially as Marriott, providing some particularly impressive vocals. 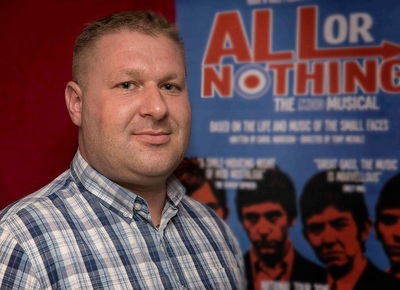 A nod also to Joseph Peters who plays original band member Jimmy Winston, for some lovely comedy characterisation and who reminded me of a young Neil Morrisey. Many of the cast double up their roles and there are some really funny moments in this show which will have you laughing out loud. Look out for the group's appearance on Juke Box Jury and Top of the Pops, with one particular presenter which the hilarious Daniel Beales plays incredibly well and had me giggling away! Chris Simmons, however, is undoubtedly the star of the show. 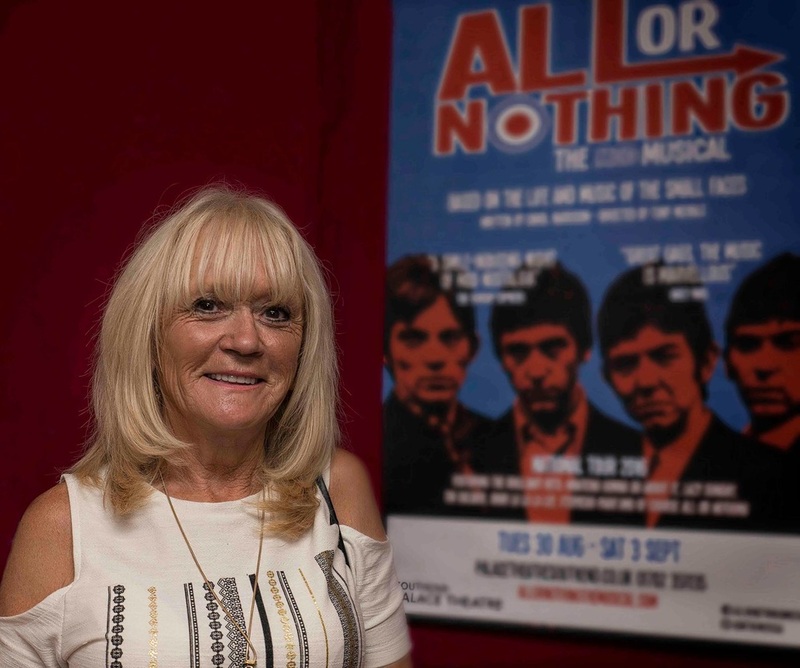 Playing the older Steve Marriott as the narrator of the piece and who, along with Carol Harrison as his ambitious and slightly eccentric mother, Kay, builds up to an emotionally climactic scene which I’m sure left a few lumps in throats. The show is enhanced by some effective sound and lighting, designed by Chris Dohan and Peter Small, which not only work really well but are essential to the fluidity of the production. 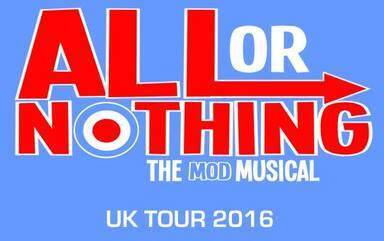 This may not be the slick and polished type of show that fans of Sunny Afternoon the Kinks musical are used to and for which this show is inevitably going to be compared with. What All or Nothing does deliver is a true and honest account of what I’m sure ‘The Small Faces’ and most importantly their fans, old and new, would be proud of. Tickets are selling well for this show so you need to be quick if you don’t want to miss out.